Today – March 11 – is the first anniversary of the Japan earthquake and subsequent tsunami. 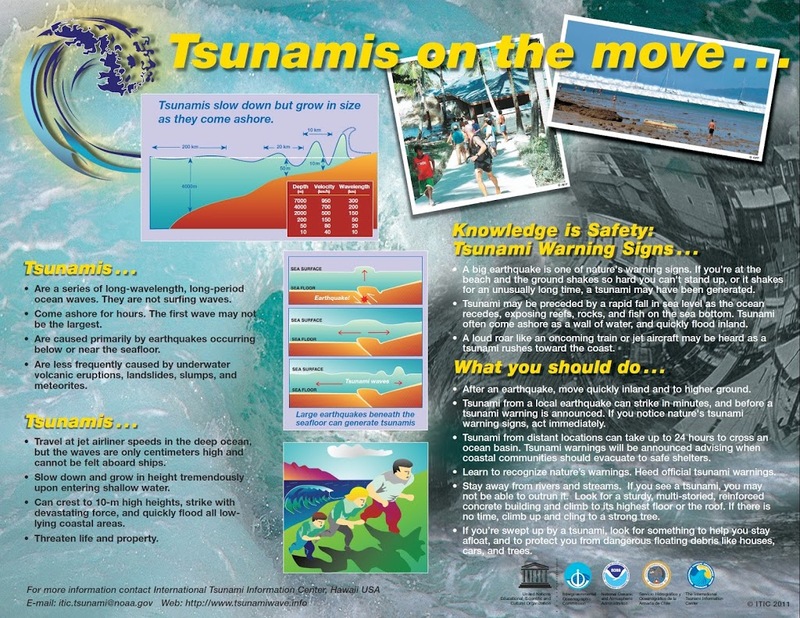 A tsunami is a series of ocean waves generated by sudden displacements in the sea floor, landslides or volcanic activity. In the deep ocean, the tsunami wave may only be a few inches high. The tsunami wave may come gently ashore or may increase in height to become a fast moving wall of turbulent water several meters high. In Hawaii, tsunamis have accounted for more lost lives than the total of all other local disasters. In the 20th century, an estimated 221 people have been killed by tsunamis. Most of these deaths occurred on the Big Island during the tsunamis of 1946 and 1960, two of the largest tsunamis to strike in the Pacific. The tsunami of 1946 was generated by a magnitude 7.1 earthquake in the Aleutian Islands. This tsunami struck the Big Island of Hawaii on April 1st. The tsunami flooded the downtown area of Hilo killing 159 people and causing more than $26-million in damages. On November 4, 1952 a tsunami was generated by a magnitude 8.2 earthquake on the Kamchatka Peninsula in the USSR. In Hawaii, property damage from these waves was estimated at $800,000-$1,000,000 (1952 dollars); no lives were lost. The waves beached boats, caused houses to collide, destroyed piers, scoured beaches and moved road pavement. On March 9, 1957 a tsunami was generated by a magnitude 8.3 earthquake in the Aleutian Islands. It generated a 24-foot tsunami that did great damage on Adak Island, especially to the fuel and oil docks. The Hawaiian Islands incurred about $5,000,000 of damage in 1957 dollars. The highest wave in Hawaii was 12-feet. The tsunami of May 23, 1960 was generated by a magnitude 8.3 earthquake in Chile. The 35-foot tsunami struck Hilo, Hawaii causing severe damage. 61-deaths were recorded and $23-million in damage occurred. In the area of maximum destruction, only buildings of reinforced concrete or structural steel and a few others sheltered by these buildings, remained standing – and even these were generally gutted. Frame buildings were either crushed or floated nearly to the limits of the flooding. On November 29, 1975, an earthquake occurred off the coast of the Big Island of Hawaii. When the quake-generated tsunami struck, 32 campers were at Halape Beach Park. The sound of falling rocks from a nearby cliff, along with earth movement caused the campers to flee toward the ocean. They were then forced back to the cliff by rising ocean waters. The first wave was 5-feet high, but the second wave was 26-feet high and carried the unfortunate campers into a ditch near the base of the cliff, where they remained until the ordeal ended. Two campers died and 19 suffered injuries. An earthquake measured at 9.0 magnitude, the sixth biggest since 1900, struck Japan on March 11, 2011. The first tsunami waves reached Kaua‘i shortly after 3 a.m. and took about 30 minutes to sweep through the island chain. Waves above 6-feet were recorded at Kahului on Maui and 3-feet at Haleiwa on the north shore of Oahu. Lost homes, sunken boats, Kona Village Resort damage, and damaged piers and roads caused tsunami damage into the tens of millions of dollars; no one was killed or injured during the tsunami. I have added some photos of tsunami impacts in Hawai‘i for several of the prior events (1946 – 2011) to a folder of like name in my Facebook Photos section.